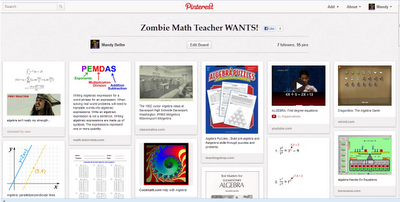 Zombie Math Teacher: Zombie is on Pinterest! Months of avoidance. Prodding from friends. "I don't need another online addiction," I told them. Pins and re-pins from several of my blog posts later... I finally bit the bullet and signed up for Pinterest. Within two hours, I was hooked. For those of us visual processors and OCD organizers, this is your dream site. You can categorize and store ideas/pictures/links/recipes with the click of a button. What I found, surprisingly, was that it's the same thing I've been doing on my Facebook page. The "Timeline" interface works virtually the same way. All your links and pictures and "shares" are stored for your friends and yourself. But Pinterest is much more user-friendly. And Pinterest is just for me, and for whoever else chooses to follow me. And whoever I choose to follow. So come join me! http://pinterest.com/mathbymandy/ or click the "Follow me" Pinterest link at the top of the page. We can share math ideas, decorating tips, recipes, and pretty much everything I blog about anyway. Just no time wasted with words. I'm going to start back-tracking through my blog posts and create a pin-board of old topics, for easier access to fellow Pinterest math buddies. So stay tuned for that.